The daylight raid on Tokyo, led by Lt Col James H. Doolittle on Sunday 18 April 1942, has rightfully entered the history books as one of the most daring and courageous operations of the Second World War. On that day, in mid ocean, Doolittle had launched his B-25 Mitchell bomber from the heaving, spray-soaked flight deck of an aircraft carrier, a deck too short to land on, and flown on to bomb Tokyo. He knew there would be no return to the USS Hornet, either for him or the 15 heavily- laden B-25s behind him, for this was a feat never before attempted, and for every crew member the mission was a one-way ticket. Yet, under the leadership of Jimmy Doolittle, they all dared to survive. The mission for the 16 bombers was to bomb industrial targets in Tokyo and surrounding areas, to slow production of strategic war material, then fly on to land in the part of south-west China that was still in the hands of friendly Nationalist forces. All being well, the mission would be so unexpected it would plant the first seeds of doubt into enemy minds. It worked – the Japanese were forced to quickly divert hundreds of aircraft, men and equipment away from offensive operations to the defence of their homeland. There was, however, another reason behind the Doolittle’s raid – to lift the morale of an American public devastated by the attack on Pearl Harbor four months earlier. And the success of the mission provided the boost that was needed. If any had doubted America’s resolve in the face of uncertainty, the courage, determination and heroism displayed by Lt Col Doolittle and his band of aviators restored their determination. Although it might take years, and the price would be high, America and her allies understood that the fight could, and would, be won. The Publisher is truly honored to have worked closely with the Doolittle Raiders in publishing this release. 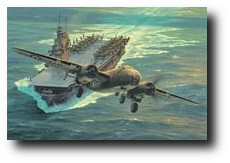 It is of great historical importance that the prints are personally autographed by veterans that took part in the raid, allowing enthusiasts the opportunity to acquire a momentous collector’s piece in what is likely to be the last Doolittle Raiders signed edition that will ever be made available. Flight engineer and gunner on Plane #15. Each print is additionality signed by two further veterans of the raid, creating a truly historc THREE signature edition. Co-pilot of raid leader Jimmy Doolittle on Plan #1.
the aircraft for the raid. Using the very latest high-definition giclée technology Anthony Saunders’ fabulous painting is faithfully replicated onto tne canvas and is issued pre-stretched from the Military Gallery studio, ready to simply drop into the frame of your choice. Each canvas is fully authorized and personally signed by the artist, stamped on the back, hand numbered and titled.